There are two pieces of information that will help you locate a physical book: the location, and the call number. First, determine the location and availability. At B.D. Owens Library, we use the Dewey Decimal System, so books are sorted numerically from 000 to 999 and alphabetically from A to Z. The Dewey Decimal System cycles through within each of these categories. For example, in Popular A, the order of the books will be BIO 000-999, HIS 000-999. B.D. 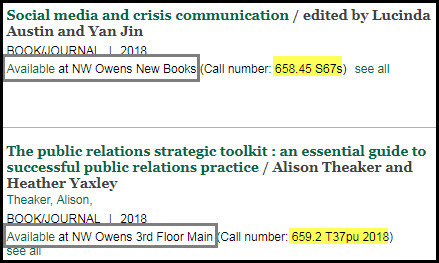 Owens Library also has a Main Collection that contains the majority of our books. These are housed on the 3rd Floor (map). If you need additional help, ask at the Library Services Desk. The LOCATION describes where the item is shelved. In this example, the book Programming in Objective-C is located in the main collection on the 3rd floor. The call number tells us that the book is in the 005 area. Use the call number ranges located at the ends of each row to find numbers beginning with 005. Read the .117 in decimal order. This means that 005.117 will be somewhere in between 005.1 and 005.2. Next, read the K76p in alphabetical order first and then by numerical order. The lower case letter is also then read in alphabetical order. 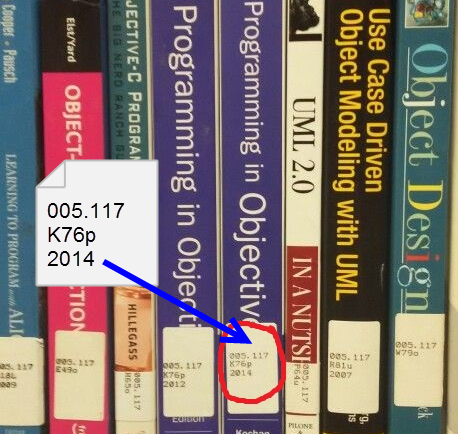 The last four digits of the example in the photograph identifies when the book was published.